The long arm of the law has been the slow arm of the law in dealing with the collapse of MF Global, among other Wall Street firms that critics and the Occupy movement blamed for the economic meltdown in 2008. That despite the fact MF Global was nowhere near the eye of the financial crisis storm. Still, it died a sudden death in the fall of 2011.
Who would have thought the once high flying, hard charging titan of Wall Street, U.S. Senator, and one-term New Jersey Governor Jon Corzine would lose it all so quickly? Reputation, included. Remarkable, really. Not all of MF Global's problems were the fault of the former head of Goldman Sachs. Nor did they stem from any conspicuous criminal behavior, as the feds saw it. Several issues were already in embedded in the company, fully metastasized, while another major one would be out of his control to solve. Call that bad timing. But it was his foot on the accelerator with ever bigger bets, never braking or letting up. Had Corzine done a deep dive on the financial underpinnings of MF Global in the decade leading up to his hire, he would never have signed on; he would have passed, walked away unscathed. But then Jon Corzine never really was CEO material. It wasn't in his DNA. So he never would have stood back to scan the bigger picture. Had Corzine done that, he would've seen criminal behavior and unsavory characters had populated the futures house. He would have seen cooked books. He would have seen some terrible business decisions made over the years, too. The risk to his reputation would have been obvious then. Once in, however, Corzine's hubris and aggressive bond trader's style, right out of his 1995 Wall Street playbook, accelerated the decline of the venerable commodities firm. In the end, his personality was his blind spot. All of this and a lot more have been captured in a readable, compact book on the fall of Jon Corzine and MF Global (MFG). 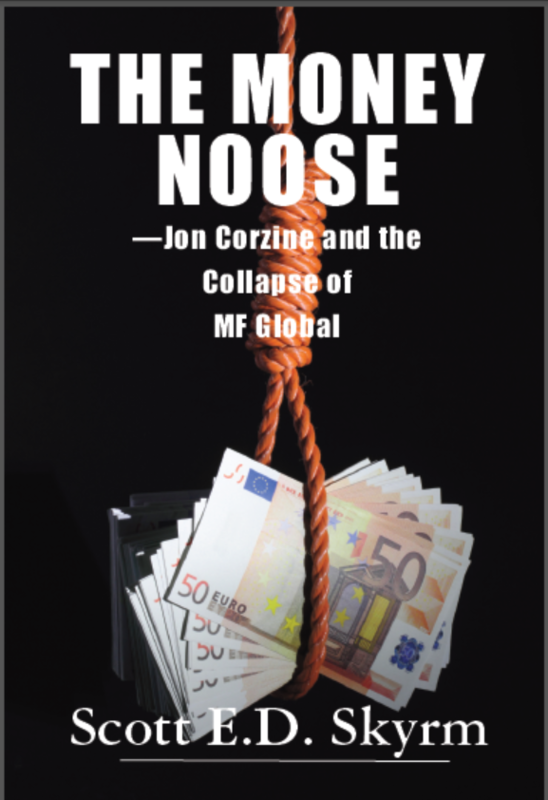 The Money Noose -- Jon Corzine and the Collapse of MF Global, written by Scott E.D. Skyrm in a breezy, detailed, cut-to-the-chase style opened this author's eyes to the shortcomings of the once fast rising political star; that and $80 million in the bank isn't much in today's multi-billion markets on the eve of MFG implosion. Not when that money has to be able cover highly leveraged bets, margin calls, and payments. The seed of self-destruction in Jon Corzine can be traced to a car accident in New Jersey. In a rush to go to a meeting, he ordered the NJ State Trooper who was driving him, to break the law in a non-emergency and speed more than 90 miles an hour, almost killing the then New Jersey governor in the crash. Worst, Governor Corzine didn't wear a seatbelt, even though he was sitting in the front passenger seat. Snarling traffic for hours, Corzine had to be airlifted to be treated for his life-threatening injuries. A week after the accident, in a press conference, the healing governor said he would begin wearing a seatbelt, while inferring that he would never be so reckless again. But then he lost his re-election bid. Out of work, a close friend offered him a job to transform a boutique commodities trading firm into a Wall Street investment house. That was in 2010. This past June, the U.S. Commodity Futures Trading Commission in the U.S. District Court, Southern District of New York, has sued MFG and Jon Corzine in a civil complaint. "When Corzine joined the Firm as its CEO in March 2010, MF Global was still principally a commodity brokerage firm that earned revenue primarily from interest income for servicing customers' deposits and from commissions on customer transactions. Corzine planned to change the Firm into a global investment bank that generated substantial revenues from proprietary trading activities. His plan included making increasingly larger and potentially riskier investment with MF Global's proprietary funds." In other words, it was Corzine's foot on the pedal. More gas, more bets, more power, all of it fuel-injected and supercharged. In the 18 months of his lab experiment to make the hard pivot for MF Global, it crashed and burned, along with his reputation. The mess was further sullied in the firm's dying days that it comingled segregated ("Seg") funds of MFG from its clients and never replaced it. Worse still, more than $1 billion of customer Seg funds went missing -- for a long time, even under the microscope of forensic accounting. But then, Corzine was never a due diligence or spreadsheet kind of guy. He was a trader, and a good one. But like a lot of bets, not all of them panned out. In reading The Money Noose, it became evident that Corzine had no regard for risk; he disdained it. When he joined MFG, he made sure that risk wouldn't interfere with his plan to grow and scale the commodity broker like a Silicon Valley tech company -- overnight. That meant he needed a lot more money to make money, while hire professional "yes" men who could accelerate that vision. Each chapter of Scott Skyrm's book begins with an anecdote that either puts the message into historical context or sets up the many fluid plot points. In meeting with Mr. Skyrm, who is personable, ebullient, and well mannered, he pointed out the five keys to the story of MFG and Jon Corzine's demise. On MF Global's acquisition of Refco: "The 2005 Refco fraud was only discovered because the five guys involved all took a day off at the same time on Columbus Day," Skyrm said. On Corzine, Mr. Skyrm noted, "Corzine ran the firm like an emperor, disposing of anyone who didn't fully support him. Once that happened, there was no one there to check his power. He learned from his days as being the New Jersey governor not to communicate anything that would leave a paper trail. So there will never be anything connecting him with the missing Seg funds." On the Seg funds, he said, "Using them as a short-term loan was common practice for intra-day at MFG. The missing funds were exacerbated by the CFTC Seg fund calculation called the Alternative Method -- which MF Global inherited from Refco and for which Corzine would have no control over its change in accounting rules. That allowed MF Global to use foreign customers futures margin." He also added, "MFG customer Seg funds were illegally transferred, but they never 'disappeared.'" The fourth key was the European sovereign debt Repo-To-Maturity (RTM) trades. "They weren't fully to blame for the collapse," Mr. Skyrm said. "Though the RTM trades were a good trading idea, Corzine overused them to juice up the quarterly profits -- " in which he was under pressure to do from the ratings downgrade gun that was aimed at his head with a one-year hard deadline. "If you traced the fall of MF Global to one event, it would be the change in the little known accounting interpretation of 'true sales,'" the author pointed out. Take the Refco fraud and its bad books, combined with the ratings downgrade overhang, the change in accounting rules midstream that turned a MFG quarterly profit into a loss, and Corzine's reckless, risk-ignoring, debt-leveraging bets in the European bond market and bankruptcy became inevitable, a fait accompli. On the MF Global liquidation and bankruptcy, he said, "During the Bankruptcy Week, the counterparties, clearing banks, and CCPs all grabbed as much margin as possible, straining MF Global's liquidity. If they had all that cash, they might have survived." "As a Wall Street bond trader yourself, at Newedge among other firms, what are your thoughts on Corzine?" I asked. "He was a trader. Always will be a trader. Corzine relived the glory of his past in the 1970s and when he was head of fixed income 1980s... He liked taking risk," Scott Skyrm replied. "There were a lot of complaints at MFG about him not paying attention to being its CEO." "What about the margin calls? What kind of role did that play at the demise of MFG?" I asked. Skyrm sat forward, and said, "The counterparties were a part of the 'money noose' squeezing tighter on MFG. It's like a run on the bank. In this case, clearing banks and clearing counterparties, like JP Morgan Chase. Those institutional firms, as soon as they see signs of trouble, they wouldn't clear trades until margin calls were satisfied. They all grabbed more and more margin." MFG's chief risk officer was fired two months after he warned Corzine about the over leveraging of his bets that went from $2 billion to $4 billion, then up to $4.75 billion, with margin calls ballooning to $700 million. Mr. Skyrm said there were two points-of-no-return events that put the final nail in the coffin of MF Global. "First, JP Morgan Chase moved into MFG's office in New York, while Citibank moved into their London office. They turned MFG's credit line down to zero and wouldn't clear any trades. In the final week, MFG tried to post more margin by tapping an alternate line of funds--a liquidity buffer from FSA London Agency in the amount of $500 million in liquid security to cover the problems with the European sovereign debt trades," he said. "But the person in position to make those funds available made himself unavailable to be reached, letting the money noose squeeze shut and send MF Global into bankruptcy." In the end, Jon Corzine did everything to turn MF Global into a powerhouse investment firm. That included abusing $525 million of customer Seg funds back in May 2011 (Count 37), replacing anyone who opposed him, betting the ranch on bonds in Spain, Greece, Portugal, and Italy to juice profits, as well as ignore his real duty to the company as CEO. Perhaps it was the last point that mattered most, coupled with his inability to ease up on the gas pedal that buried MF Global. Anyone who wants to read the high-wire act of Wall Street finance as a cautionary tale, The Money Noose is highly recommended.